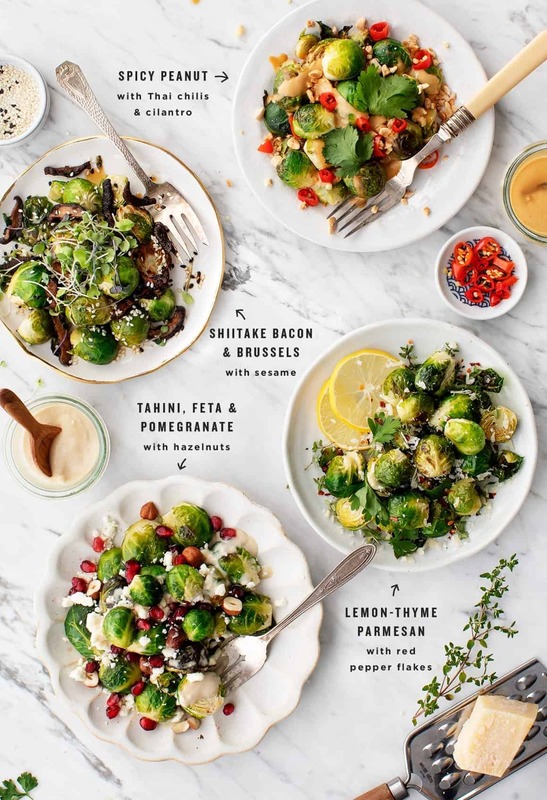 Roasted Brussels sprouts are a hit side at any holiday dinner. 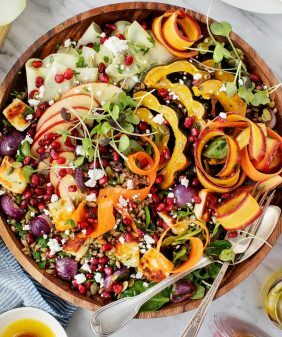 You'll impress guests and have fun eating your veggies with these 4 easy variations! Earlier this fall, I started making a list of my potential Thanksgiving blog recipes. 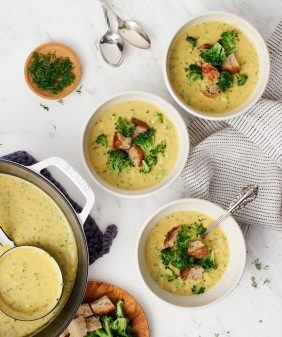 One of the items on that list was called “Brussels Sprouts TBD.” As every other recipe got named, resolved, tested, and put in the works, “Brussels Sprouts TBD” remained on the list just like that. I love love love Brussels sprouts at this time of year, but I just couldn’t settle on one idea or flavor combination. Then it hit me – I’ll post many ideas! And you can choose! Sprinkle crushed peanuts over the top and add sliced Thai chilis to wake everyone up at the T-giving table! I don’t often pick favorites in these situations, but I’m going to this time. This one is my favorite! 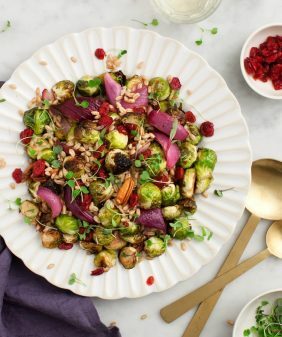 Drizzle the sprouts with lemon tahini sauce, top them with feta & hazelnuts, and finally, sprinkle on pomegranate seeds. Together, these elements make a perfect combination of creamy, tangy flavors with a pop of pom. I’m finishing this list with a classic combination. It may be tried and true, but that doesn’t make it any less special. Obviously, I love lemon on (just about) everything. 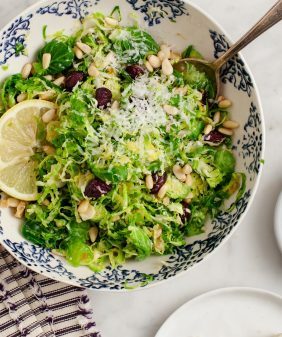 In this recipe, salty Parmesan and herbaceous thyme leaves bring out the lemon’s brightness on the sprouts. Yum, yum. Love to make things many ways? Try stuffing sweet potatoes or making overnight oats! Preheat the oven to 425° and line a baking sheet with parchment paper. Slice the Brussels sprouts in half, toss with drizzles of olive oil and pinches of salt and pepper, and spread on the baking sheet. Roast 30 to 40 minutes or until tender and golden brown around the edges. Continue with one of the recipes below. 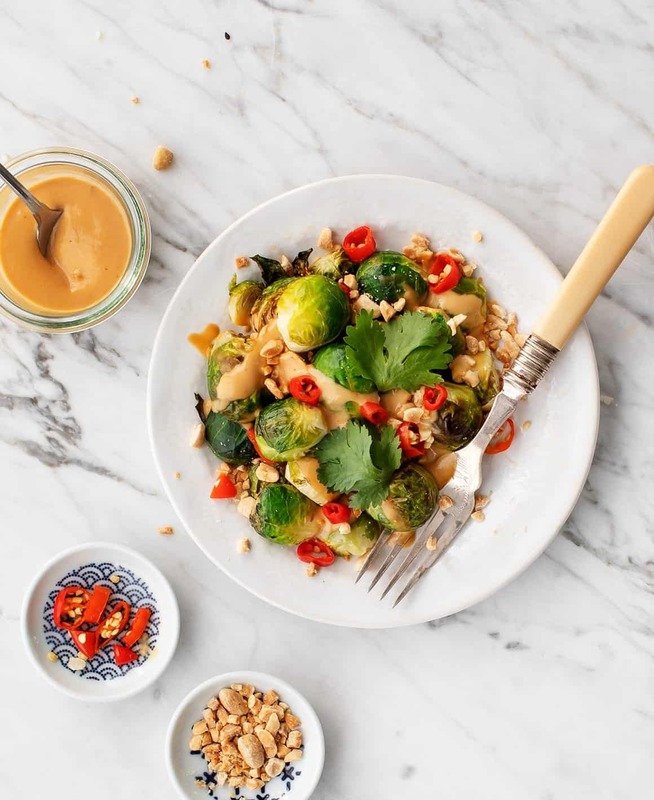 In a small bowl, whisk together the peanut butter, lime juice, tamari, and sriracha. Add up to 1 tablespoon water, if necessary, to create a drizzle-able consistency. Drizzle the sauce over the roasted Brussels sprouts. Top with the crushed peanuts, cilantro, and sliced red chiles, if desired. Make the Shiitake Bacon (can be made ahead and stored at room temp): Preheat the oven to 325°F and line a large baking sheet with parchment paper. Toss the shiitake mushrooms with the olive oil and 1 tablespoon of the tamari and and toss to coat. Spread in an even layer on the baking sheet. Roast 30 to 40 minutes or until dark brown and lightly crisp around the edges. In a small bowl, combine the additional 1 teaspoon tamari with the sesame oil and rice vinegar. Pour over the roasted Brussels sprouts. Top with the shiitake bacon, sesame seeds, and microgreens, if using. In a small bowl, whisk together the tahini, lemon juice, garlic, maple syrup, and salt. Add up to 3 tablespoons water, if necessary, to create a drizzle-able consistency. Drizzle the sauce over the roasted Brussels sprouts. 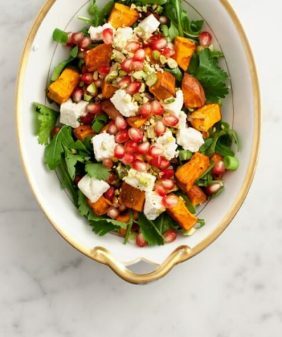 Top with feta, pomegranates, and hazelnuts. Toss the roasted Brussels sprouts with the lemon juice, Parmesan, and thyme leaves. Garnish with parsley and red pepper flakes, if desired. Serve with additional lemon wedges. I love your “many ways” ideas! I can’t decide which to have for Thanksgiving, but I know I’ll try them all eventually. Ooooh, I want to try them all! I look forward to being able to eat brussel sprouts all year round (I even loved them as a kid)! These recipes are all great, I’m particularly excited to try the Shiitake bacon one, it seems like a great vegan umami take on a classic! 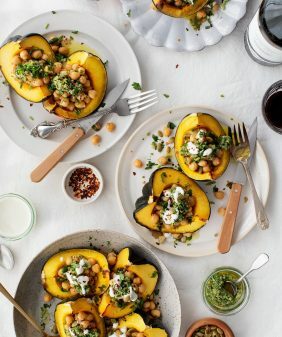 I made the acorn squash with chickpeas to test for thanksgiving. It is beautiful as well as delicious. Absolutely LOVE the chimichurri and think it has possibilities to spice up other dishes. Hi Maureen, I’m so glad you loved it! Let me know what you use the chimichurri with next time! These looks so easy! Plus I love Brussels can’t wait to try them! The food is looking amazing. So many variety of making Brussels sprouts. Thank you for giving all this recipe, I would love to make it all.